The well from which Wes Anderson’s films are derived never go dry or run short on the same predictable sense of sardonic, caustic humor. It’s branded as eccentric entertainment, and I’ll admit that this level of wit demands thought, perception, plus a keen eye for detail. It’s an appropriate trademark for a director who makes stunning and lavish looking pictures, as well as stories which refuse to emote true emotions. I’ve long lambasted Anderson’s films, calling his movies efforts I deeply admire but never really enjoy, and I’m now realizing that it’s because his stories or so self-involved, recyclable, and indulgent that they miss out on the kind of personality and inflection that can come from the bitter, twisted tongue of sarcasm. At this point it feels pretentious to call a Wes Anderson film pretentious, and yet Isle of Dogs is hardly different from the rest of the pack. More often than not, I can typically tell if I’m going to like a movie within the first 10 minutes. Isle of Dogs didn’t make a good impression on me, mostly because the film begins with over-explanatory narration and, for reasons I still cannot comprehend, a literal “note to viewers,” telling us what to expect through a posturing title card instead of showing us rules/details through carefully plotted action. It’s a bit condescending and disruptive to have a movie expect that you might “just not get it, so here’s why you should.” If a film has to explain and justify its rules, I’d argue that it’s not a very well-written movie, and probably a bit too self-conscious to be taken seriously in the first place. 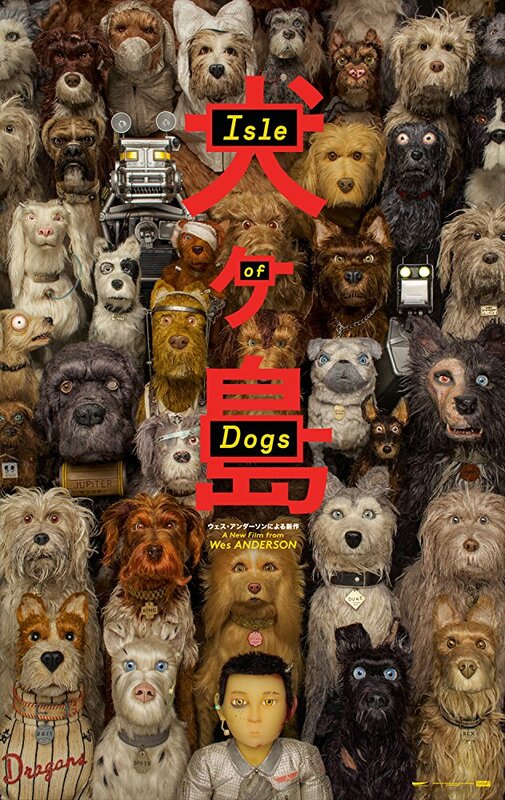 Isle of Dogs wants to juggle style and tone and countless characters despite being all thumbs, using subtitles and mixed languages at its own convenient disposal. It’s evident how much time and meticulous effort went into the production design, so why not the same approach to how we hear/read the story? That being said, the dueling plots share nice thematic elements and gel together nicely even when the film doesn’t adhere to its own logic or regulations. In Japan’s imaginary Megasaki City, a centuries long grudge leads Mayor Kobayashi (Kunichi Nomura) to expel all dogs to Trash Island, an infested wasteland far from the archipelago. Meanwhile, 12-year-old Atari (Koyu Rankin) flies to this dump in search of his long-lost dog/bodyguard Spots (Liev Schreiber). A few good boys help Atari because they’re bound to be obedient (forgettably voiced by Bill Murray, Edward Norton, Bob Balaban and Jeff Goldblum). As per usual, Anderson holds his actors on a tight leash save for Bryan Cranston of the crotchety stray Chief. As I noted in my review of the pedantic The Grand Budapest Hotel, he restrains his performers to do just the opposite of what they’ve been taught or learned. I go to the movies to feel something. To be excited, to laugh, to cry, to get angry and upset. Once again, Anderson has created a picture jam-packed with visual wonder, but you might as well watch it on mute. Story shouldn’t be a background singer to the mise en scène of a set. Isle of Dogs is lovely to observe, and I won’t be angry when it’s nominated for best animation feature this coming awards season; the stop-motion work is pretty incredible and exhausting in its detail of Japanese culture (whether it does Japan justice is better suited for a long thinkpiece). Yet in the same breath, it’s a clumsy story of friendship without much camaraderie that’s been deconstructed to death by a chef who has all of the right tools and an unrestrained vision. It’s also a hot take on the corruption of democracy and a political tale encouraging the acceptance of refugees without delivering a singular message of empathy. Isle of Dogs is a neat film, not because it’s interesting, but more so because everything ends so tidily and idealistically, and for a filmmaker who rarely caters to or caves beneath the weight of raw emotion, Isles of Dogs ends in a way that’s as promising as it is perplexing and frustrating. I’m starting to think that of all his work, I can say that I’d rank Rushmore at the top. Not because it’s good or even great, but because tucked inside all of those idiosyncratic zooms and whip pans and chapter-like structures is something small that can be latched onto and understood. Anderson is a master of auteurism, and I hope he realizes that simpler stories can say more and that less can be best.